Online craps is one of the more intimidating games you’ll find at the casino. In order to play like a professional, you would need to dedicate a significant amount of time to learning all about this notorious game. For this reason, online craps are great. If you register as a free player you can practice as much as you want before risking any hard earned cash. Where online craps fall short, however, is in terms of the social aspect of the game. Craps is arguably the most entertaining game you’ll come across at any land-based casino. It’s a theatrical game with dramatic tossing of the dice and cheering crowds. A high-energy craps game is almost guaranteed to draw a crowd. Online craps games offer a limited social component via live chat, which allows players to communicate with one another during live, multi-player games. Unfortunately this doesn’t have the same level of excitement one experiences while gathered around a real craps table. Based originally on the British game “Hazard,” craps was later played in New Orleans in the 18th century. The name comes from the French word “crapaud,” which means “toad.” It was thought that when gamblers huddled around the craps tables, they looked like a group of toads perched on their haunches. When French traders and noblemen brought the game to America it was virtually the same game that had been played in Europe. There were some minor adjustments, namely a few rules were added to make the game fairer. Online craps and the craps games you’d encounter in a land-based casino is different than street craps, which focuses more on the rolling of the dice and removes many of the complex betting rules that are associated with the traditional version of the game. The beauty and frustration with online craps comes from the fact that the game is relatively easy to learn, but challenging to master. It’s entirely possible to learn the basics of craps within minutes, but to really understand the different types of wagers requires research and lots of practice. However, craps is definitely worth learning. Online craps has some of the best odds, but also some of the worst. Study and hands on experience will help you to identify the right bets. Place bets offer some of the best odds at the craps table. These bets are made on “point” numbers, which are four, five, six, eight, nine and ten. Place bets can be made at any time during a round of online craps. 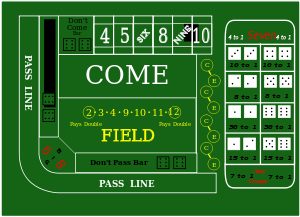 A place bet involves wagering on a set number being rolled prior to the next roll of a 7. Come bets are the same as pass line bets, but you can lay down a come bet with every throw of the dice, once the point has been determined. It is one of the better wagers you can make in an online craps game. Other common online craps best are the Don’t Come Bet, Hard Way Bets, Horn Bets, Pass Bets, and Don’t Pass Bets. In order to be truly successful at the online craps tables it’s important to familiarize yourself with all possible bets and the payout percentages for each. Play for fun until you’ve mastered the basics. That way you can preserve your bankroll for a real online craps gambling adventure!